This step by step guide created from a post by rprade. Input: receives a high (5V) or low (0V) digital input from some other device. These inputs are pulled high by an internal resistor so a switch wired between the input pin and GND would read high with the switch off and low with it on. Analog In: this is an input to read a varying level input and convert it to a value. This input can vary between 0V and 5V and must not exceed 5V. PWM: a Pulse Width Modulated output generally used to control the brightness of an LED. The output is a square wave with the on time varied between 100% and 0%, but always 5V during the time it is on and 0V during the time it is off. [*}RGB a device that combines 3 PWM channels into a single RGB control specifically for control of LED devices with RGB outputs. All of the above is in the Arduino plug-in help file accessible from the upper left corner of the plug-in configuration page. After you install the Arduino software you MUST copy the additional and modified Libraries to the Arduino software installation location usually c:\Program Files (x86)\Arduino\Libraries if it is a 32 bit version of Windows the (x86) will not be there. These can be downloaded from the Plugin Config page by clicking down arrow after the words Download the Arduino libraries. Your Arduio board will be assigned a COM port when it is connected to the computer. In most cases the computer will have COM1 and COM2 assigned and when you plug in the Arduino it will be assigned COM3 or some other COM above 2. There are a number of ways to determine what is assigned, the easiest for you might be to go to the plug-in configuration page, with the Arduino unplugged. Click the Connection drop down and note the COM ports offered. 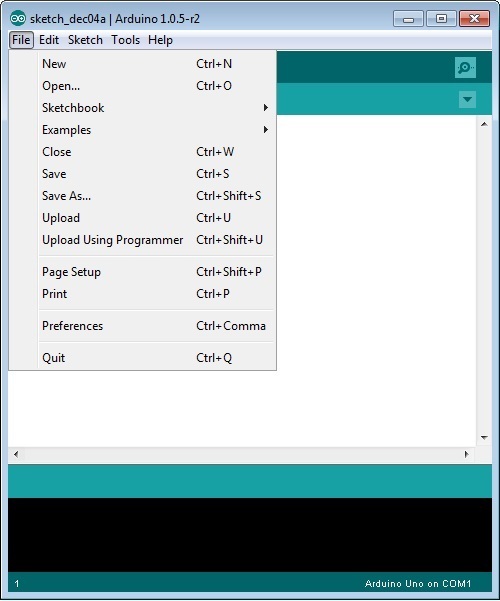 Then plug in the Arduino, reload the configuration page, click the Connection drop down and note the COM port that is added - that will be your new Arduino board. Below is a screenshot of mine with no Arduino USB connections made. The version number in the screenshot below is a beta release. Your version should be the current production release or Beta if you chose to run it. Set the Connection to the new COM port, then download the sketch for the board. There will be a "Download Sketch" (or Firmware depending on plug-in version) button "for board no:" select board 1 and click the arrow to download the properly configured sketch. Click "OK". Then you will need to configure the board type (Mega, Uno, etc.) and the Serial Port from the "Tools" drop down. Then select "Upload" from the "File" drop down. 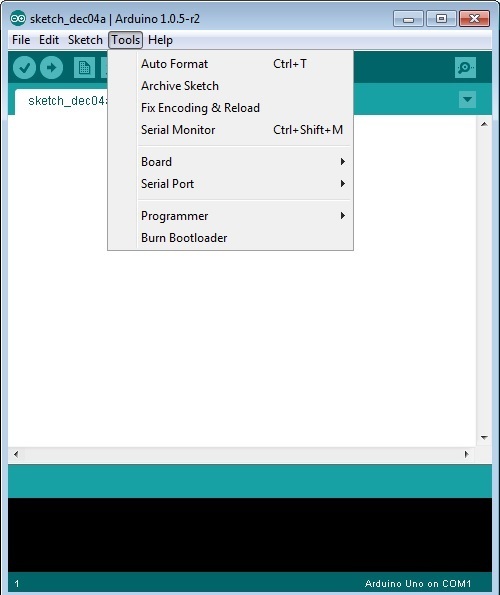 Once the sketch is uploaded (the software will say "Done Uploading" at the bottom), close the Arduino software and reset the board by pressing the reset button. You should now be able to connect it to HomeSeer. Click the Connect button and select the Auto Connect check box. You can now add pins. 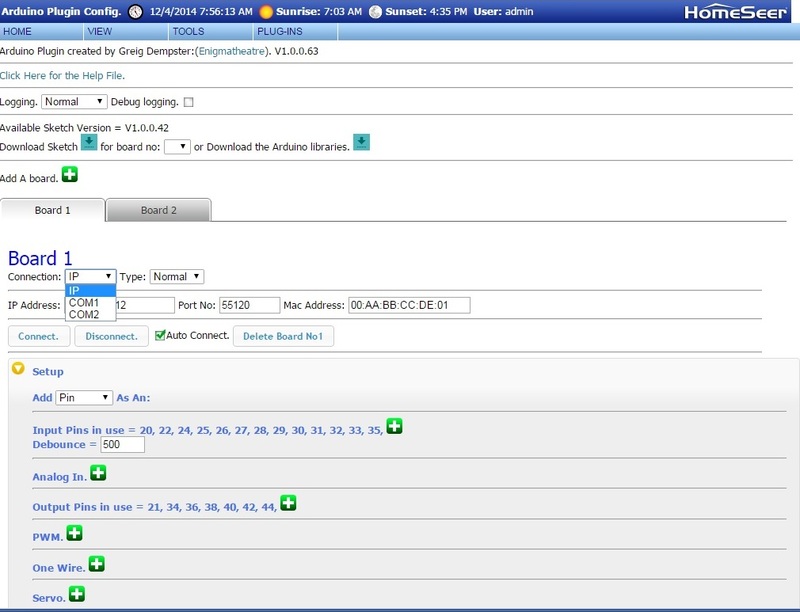 There will be devices created in the HomeSeer Device Manager with controls for each pin you create which can be manually controlled or controlled by events like any other binary device. The plug-in help file has all the information you need, I have just provided more detail. Below is a screenshot of the 9 outputs I created for valve actuators in my heating system. I changed the status graphics to more correctly show the status than the default light bulbs.